Ion Audio is probably best known for creating those nifty turntables that help those of us who own vinyl records to conveniently convert them into a digital file format. Now, the company has used its digital conversion know-how to create a device that can scan a 200-page paper book and convert it into e-Reader format in 15 minutes. 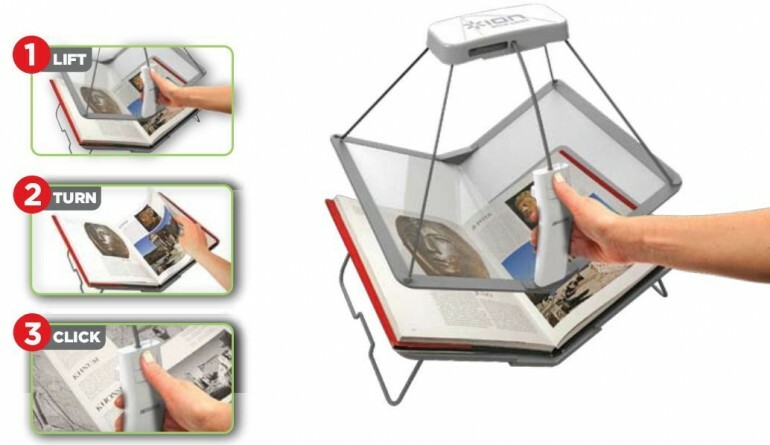 The Book Saver Book Scanner will allow you to quickly digitize your huge library of printed books or magazines for archiving on computer or to take on the road without weighing down your backpack or suitcase. Many of my vinyl albums have never even made it to CD release, let alone become available in digital format for download from one of the many online stores. So it was with some relief that technology arrived which allowed me to record high quality digital copies of my treasured rarities and pop them onto my media player. One of those leading the charge was Ion Audio, who released record players with a USB cable that could be connected to a computer for handy digitization. Now, the company is offering the same conversion convenience to owners of literary tomes. The Book Saver consists of an angled cradle, onto which is placed the printed novel, textbook or periodical requiring digital conversion. An upper frame sporting two cameras – one pointing at each page and each having a built-in flash – is placed on top of the publication in the cradle. A snap of each page is recorded at the press of a button, then the camera frame is lifted, the page turned and the whole process repeated until the last page is reached. The digital conversion is stored directly onto an SD card, for onward viewing on an e-Reader or archiving to a computer. Whereas other devices that offer similar digitization can take up to seven seconds to scan one page, the Book Saver is said to capture its two-page digital representation in just one second.